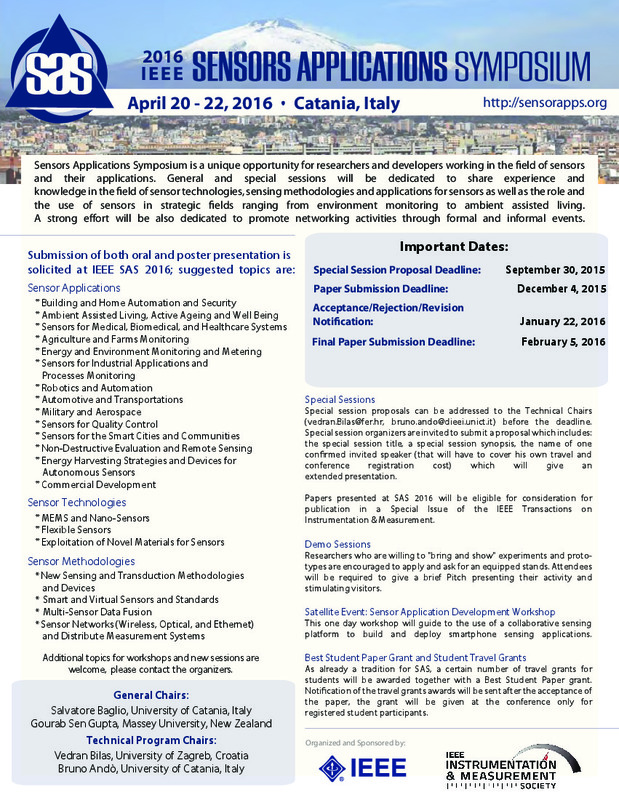 We invite to submit your Extended Abstract of maximum three pages. Each paper must be within the scope and topics of SAS 2016, follow the same formatting guidelines provided on the SAS 2016 website, explain the significance of the technologies/methods/applications in the paper, and contain a list of key references. A single step peer review process will be then applied. Authors of accepted papers must register for the Conference and attend to present their papers in the dedicated Poster Session. Accepted papers will appear in the conference proceedings distributed during the conference, but will not appear in IEEE Explore. However, authors of papers presented during SAS 2016 will be allowed to submit extended versions of their papers to the Special Issue of IEEE Transactions on Instrumentation & Measurement on SAS 2016, to be published in 2017. *The maximum length for final papers is 3 pages without exceptions. The next page you see will have a large green check mark and a statement that the paper was registered. The last row says Manuscript, and has an icon of a yellow folder next to it. Click on this icon, and then you can upload the PDF of your Paper on the next page. Manuscript is used to refer to the PDF form of your paper. You can also upload the paper by clicking the My Papers tab at the top of the screen, and then select the upload icon on the same row as the name of your paper. The upload icon (third column from the right) will open a dialog box that will enable you to select and upload the paper file via the web or via FTP.